The possibilities of a pallet headboard are nearly endless. With the creative opportunities of a DIY pallet project, you are also bringing in a comfy addition to your bedroom. Overall, it’s an easy project you can customize to your skill level. Let’s get started on how to make a pallet headboard. Before you get started, you need to know how large of a headboard you need to build. There are standard bed sizes, so you'll want to know what bed type your building a headboard for. ​Your headboard will need to be ​at least as wide​ as your bed is. We recommend extending that size by 3" on each side, as we'll discuss later. Adding three inches onto your initial measurement makes sure that your bed is fully covered, and also locks your bed in from a design perspective. Your headboard will not just be sitting flush: since your bed is slightly smaller, this will create a secure place for it to fit with the headboard against the wall. Keep in mind the standard bed sizes when you measure for your headboard. Because a standard twin size mattress is 39” wide, one pallet might be enough. For any other bed type, you'll need more than one pallet. Every good woodworking project starts with a great setup. You can easily complete this project in a day or even just a few hours if you have everything ready to go before you start. Don’t be discouraged by the long list. Everything but the pallets is definitely doable in one shopping trip. Similar to other pallet DIY projects for around your house, gathering all of the supplies at the beginning will save you time in the long run. Ok, lets get started! Once you have your materials and measurements, you're ready to begin.There are a few creative choices that begin with your setup. ​A pallet comes assembled and nailed together. For this headboard design, you need to disassemble the pallet so that you are left with a bunch of long, rectangular boards. ​Be careful pulling the wood off of the pallet. Pallet wood isn't the highest of quality. Beyond that, it has often been hastily constructed, and potentially has been sitting out for awhile. All of this leads to a fragile situation. Pallets are normally nailed together at the ends, so you can use the backside of your hammer to pry out the nails. You can also use a crow bar if you have one. Try to damage as little of the wood as possible (although some casualties is to be expected). Now that you have a bunch of pallet boards, you need to trim the ends of each board. During the removal process, chances are that you damaged some of the ends. We need each end to be square, and free from damage. For this, the highly versatile jigsaw is the perfect portable tool to use. You only need to trim the edges of the pallet boards that got messed up. Use your jigsaw or circular saw to quickly trim the edges. Note: for greater accuracy, you can also use a table saw if you have one. A portable, high quality table saw allows you to set a fence according to one measurement, and then rip out a bunch of cuts very quickly. You'll be sanding more at the end of the project, but its good to give all of the boards a quick, rough sand. Get out your sander and give them a quick sand job, or you can also use a planer if you have one. If you’re ​going to paint your headboard, it may be easier if you sand down your pallets first. In that case, grab some “lower grade” sandpaper. The grades are an indicator of how fine the sandpaper is. Usually pallets are not gritty. After you clean them, a very fine sandpaper can disrupt enough of the top layer. The paint will appear evenly in layers and you won’t see a ton of paint brush lines. If, instead, you're going to stain and finish your headboard, then you can save some of the detailed sanding for after construction. Finally, examine your wood for any big holes or gaps. You can fill those with a filler that is designed to take stain or paint now. The wood filler will cover the holes, and actually make the entire piece of wood stronger. 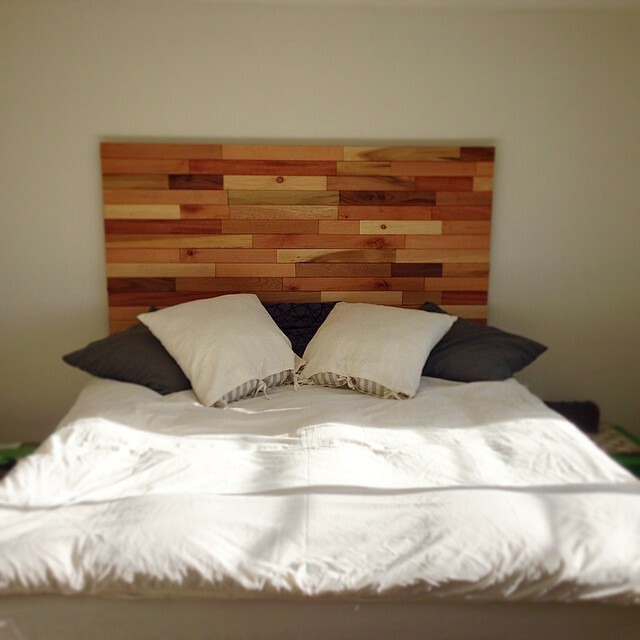 There are a number of ways to make a headboard from scrap wood like pallets. This specific process focuses on a simple, easy plan to execute. There are a lot more complicated and sophisticated versions out there - we focus on ease of execution! ​​Final Measurements: You already have the measurements for the width of your bed - all you have left to decide is how high you want your headboard to be. Most headboard frames are 24 – 36 inches tall, but you can makes yours as tall as you want. You will also need to add two legs to the frame. These legs will attach to your bedframe to hold the headboard in place. The legs need to be long enough to reach your bedframe, and high enough to take into consideration the size of your headboard plus your box frame and mattress. ​Measure your bed from the top of the mattress to the floor and subtract three inches. Subtracting a few inches puts your headboard right below the top of your mattress. ​Review: you need measurements for your headboard width and height, and measurements for your two legs. ​​Headboard Frame:​ This isn't hard. Take your finished measurements and, using the 2x3's, build the frame. Use scrap cross pieces from your disassembled pallet as cross beams in the frame for support. ​Attach Pallet Slats: ​Now is the time when your project begins to take shape. You need to cut to size and attach your pallet slats to the front of your frame. You want the slats to be alternating in terms of the break points between the boards. Since they are already different shapes from the cutting that was done in a previous step, you might as well lean into the rustic, eclectic look. While we didn't list on the supplies, if you have a nail gun, now would be a great time to use it. ​Attach Legs: ​Take your legs and attach them to the back of your simple headboard frame. Take care to measure again before you attach. ​​Paint, Stain, or Finish: Now its time to apply the finish you're looking for. Whether you want to paint your pallet wood, stain it, or just add a coat of clear finish, you'll want to add some sort of finish work. ​Attach ​Headboard to Bed: Your bedframe is complete, and all that is left is to attach it to your bed. Grab a buddy for this part, as you want the headboard to be square with the frame. ​At any point along the way, feel free to add your own customization. That's the wonderful thing about working with pallet wood - no two pallets are the same. Every pallet is a little different, which affords you the opportunity to add your own personal flair to every pallet project. From the directions above, your pallet is simple and rustic looking. If that’s not the look you want you’re still OK. One of the benefits of working with pallets is how easy they are to customize. Nail planks over your headboard into designs such as triangles or create a barn door look. Use multiple stains or paint colors creating greater dimension. Apply a matte or low gloss finish over the border, making any high-gloss finish areas appear larger. There are many ways to make your simple pallet headboard unique. Keep an open mind and use your time setting up as an opportunity to explore what you can do with the blank slates in front of you! The other creative aspect you encounter on this list is the stain and finish. A finish works great. But, there are a few options in how glossy or matte you want your headboard. Paint typically can take a matte look very well. So can a light wood stain. However, most dark wood stains look best under a high gloss where they catch light. This trick can help make your room larger or, inadvertently, smaller. You can definitely complete this project without power tools. However, save yourself the struggle. A power drill, or power saw can reduce the number of hours you spend working on a simple pallet headboard. You now have a completely unique headboard! When installing your headboard, you can support it on the legs you’ve created or by attaching it to the wall. This added step is for safety although it isn’t likely your headboard will be coming down with your mattress in front of it. Now, show off your unique headboard and pass these directions on to your friends when they’re wondering how to make a pallet headboard for themselves!